"Thanks for providing a great service at a more than reasonable price. ...surprised as to how easy the process was, ...how many inquiries I received, ...interested buyers that showed up... I'd use your services again without a second thought. I saved well over $10,000 and would never list a home with a realtor again!" Looking to SELL an existing property or BUY a new property? 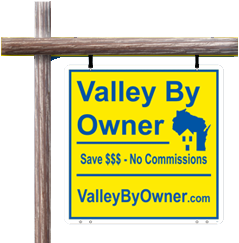 VBO is a locally owner and operated website that has helped "FOR SALE BY OWNER" customers for over 20 years. We’re LOCAL. Always have been, always will be. Our friendly staff will assist as necessary. We’re affiliated with LOCAL service providers who can assist you every step of the process. We have STRATEGIC SERVICE PROVIDERS who understand “For Sale By Owner”, and are ready to help you every step of the way. We assist with your offers and counter offers; help get buyers pre-qualified, print you open house sheets, and close your deal. We MAKE IT EASY FOR BUYERS to find your home. Multiple search options on the site are available for buyers to find your home. We also maintain a FACEBOOK page, and will post your new listing there too. We provide FLEXIBILITY. You manage your page information, and change it as needed. Set open house dates and times. We have a BRAND. People know valleybyowner.com. We have bright, professional, and recognizable signs. We have a HISTORY OF SUCCESS. We’ve helped sell over a thousand homes since 1999. We maintain high Google placement for more search hits – this means higher visibility for your property online. Talk with our Experts ---- Browse through the Properties.